Your flooring should be two things above all else: safe and secure. And on top of that, wouldn’t it be nice if your flooring could also be beautiful? We here at Kwekel Epoxy Floors certainly think it should be. And to help make your flooring as strong, secure, and beautiful as can be, we offer top-quality epoxy floor coatings! 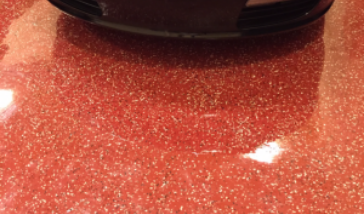 A high-quality epoxy coating gives concrete flooring a beautiful new color and luster. But also very desirable is how durable and stain resistant the concrete flooring becomes. Whether it's on the concrete of your garage, your airplane hangar, your warehouse, or throughout the interior of your Sarasota home, the epoxy coating waterproofs, beautifies and protects the flooring surface. It provides a hard, chemical repellent surface that is really easy to clean. Of all the rooms in your home or business, it is your garage flooring that perhaps most benefits from an epoxy covering. With its slick yet slip-proof surface, epoxy flooring will prove to be one of the safest options for your garage flooring. Thanks to an epoxy covering, you’ll experience no more tripping into the many sharp and heavy objects throughout your garage, and no more falling over an errant spill: just a safe environment in which for you to work. Epoxy is just about the best thing you can do for your concrete flooring. It provides a beautiful surface -- one much more appealing than concrete itself -- and it increases your concrete’s durability. On top of that, with epoxy flooring, you won’t have to worry about stains since you can simply wipe away spilled goods. If you run a commercial garage, then you understand that safety is pinnacle. All it takes is one slip into the most unfortunately placed sharp object for your whole business to be turned onto its head. To prevent this issues, just get a slip-resistant epoxy flooring. On top of slip resistance, epoxy flooring also boasts greater durability that will prevent your commercial garage flooring from cracking under the pressure of the heavy equipment and vehicles whose weight it’ll endure daily. Epoxy flooringConcrete is incredibly durable and beautiful if installed correctly. For this application, you need an experienced concrete artist. Kwekel Epoxy Floors is your Sarasota concrete flooring specialist. If you're ready to take your For quality concrete flooring from drab to fabulous, call the Sarasota epoxy flooring experts at Kwekel Epoxy Floors today at 386-308-9488 or complete our online request form.